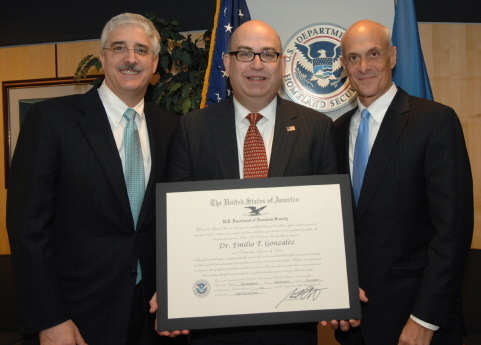 Emilio T. Gonzalez, the incompentent head of U.S. Citizenship and Immigration Services–the agency that spends less than 6 minutes reviewing each request for green cards and citizenship–has resigned. Gonzaleza, as you’ll recall, is the guy who gave himself an award he created for “Outstanding American By Choice” (an award that illegally discriminates against Americans on the basis of national original because if you are a natural born citizen, you couldn’t receive it). He’s also the guy who sicced federal agents on his former Director of Security Michael Maxwell, for daring to speak out against lax scrutiny of aliens seeking entry to and citizenship in our country. And he’s the guy who fired USCIS contractor Sultan Farakhan for decrying the fact that he (and all USCIS employees at the time) as not allowed to check immigration applicants against terrorism databases. Oh, and Gonzalez gave monetary bonuses to employees for speeding through (and approving) immigration applications. The whole entity is terminal and beyond repair. Yup, that’s how bad things are. Good employees have given up on the system working. They’re at the point where they will merely settle for a nice guy idiot over a bad guy idiot. I have recently informed the White House and Secretary Chertoff of my decision to resign as Director, U.S. Citizenship and Immigration Services effective April 18, 2008. This was an extremely difficult decision for me but one that I had to make. Since 1999, due to my professional commitments and requirements, I have led a part-time family life. The time has now come for me to return to being a full-time husband and father. After taking my family on a well-deserved vacation, I will pursue other opportunities in south Florida. contractors. Together we have taken this agency to new heights. Your commitment to the security of the United States is unparalleled and I am honored to have served as your Director. I will continue to lead USCIS until my final day in office. In the meantime, I look forward to thanking as many of you as possible for your service, support and friendship. Nice letter. Too bad it doesn’t reflect the two years of increased corrosion of our borders and national security under Gonzalez’s lackluster “leadership”. All of the extremist Muslims–many with ties to terrorists–that got green cards or citizenship during the last two years, blame Gonzalez for those. Hey Debbie, that’s good news for a change! and still the cis mess will stay the same. contract employees, not government employees, receiving the mail, cashing the fees and deciding what to do with the applications that come in. and below them, temp employees who can’t speak a word of english to save their lives. the united states can not be destroyed from the outside, but it sure can be from the inside, by incompetents like gonzalez who are given responsibilities wayyyyyy over their heads.